This morning today’s Gospel from Luke offered this message to us… a brief lesson from Jesus on how to live. Wishes of L’shanah tovah tikatev v’taihatemt to all who celebrate Rosh Hashanah.This greeting means may you be inscribed (or sealed) for a good year, or sometimes one will say, a sweet year. That is behind the symbolism of dipping apples in honey for Rosh Hashanah. Read a little more about that at this link. 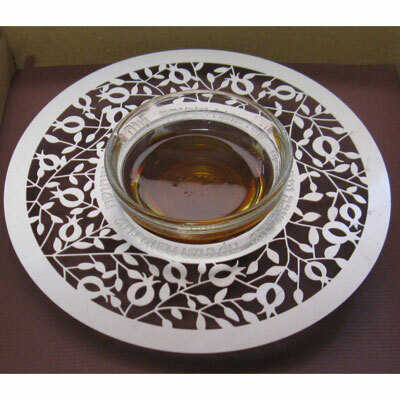 The apples and honey dish below can be ordered from Gans, in Jerusalem, a lovely shop. Perhaps Mark and I remain the only non-Jews who ever had a wedding registry there? I don’t know! OK, you’re thinking, this is the blog of a Catholic, what’s with this? Well, as I like to remind everyone, Jesus was born as a Jew, lived as a Jew, died as Jew. Questions? Good – that’s what I thought, let’s move on. Anyway, as I have mentioned numerous times before, I have some Jewish roots of my own, and my heart is moved by these holidays as well as the ones I celebrate. 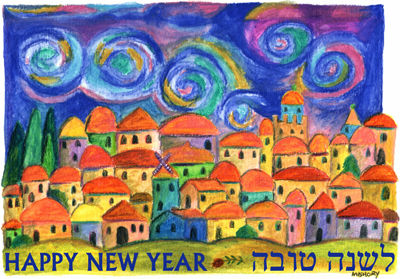 Rosh Hashanah, for those less familiar with it, opens the new year celebration. It is followed by the Days of Awe, and end with Yom Kippur, which is the holiest day of the year. On that day, one comes before G-d and fasts and prays, in order to make amends and start fresh. That is why I was stuck by a recent column, written by my friend, Diane Cameron. 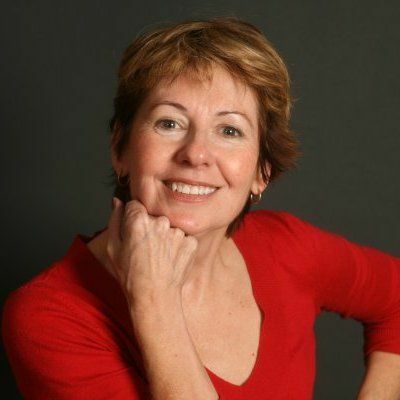 Diane is an author who lives in the Albany area, and has a regular Times Union column. my life has been greatly enriched by knowing this talented and wonderful woman. On Labor Day she wrote about how it feels so much like a new year, more than January does. Go read her column, it is right here. It was very thought provoking and hit home for me. And very much in line with the Jewish new year. Whoever you are and however you celebrate days, I wish you a sweet new year. Here’s a fun Rosh Hashanah music video, with a unique interpretation of the Daft Punk song, Get Lucky, done up Jerusalem style – Get Clairty. May we all be sealed, may we all be changed. My wishes are for days of transformation for one and all.